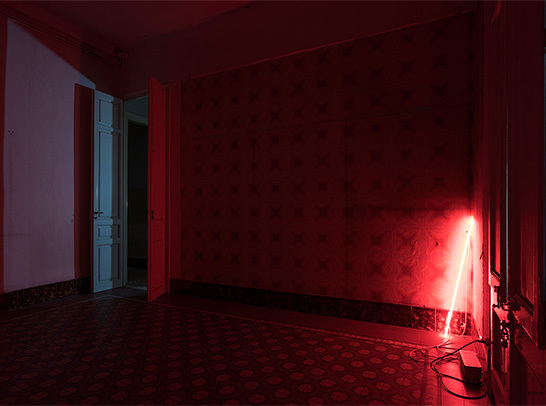 Interventions by Daniel Steegmann Mangrané, Jordi Mitjà, Rasmus Nilausen & Pere Llobera, Dora García and David Bestué. Photos: Latitudes (1), rest by Roberto Ruiz / Courtesy Barcelona Gallery Weekend. With the participation of: David Bestué (at the Factory complex Cosme Toda, L'Hospitalet); Dora García (at the Biblioteca del Campo Freudiano de Barcelona); Jordi Mitjà (at the Museu Geològic del Seminari de Barcelona); Rasmus Nilausen in collaboration with Pere Llobera (at the house of a former priest, gardens of La Central bookstore, Raval); and Daniel Steegmann Mangrané (at the Umbracle, Parc de la Ciutadella). Latitudes curated five interventions specially conceived and commissioned for the first Barcelona Gallery Weekend. The projects complimented the calendar of exhibitions in galleries and museums by presenting the new projects by artists active in the Barcelona art scene. A series of interventions responded to singular locations – public and private sites significant for their architecture, activity or their history. 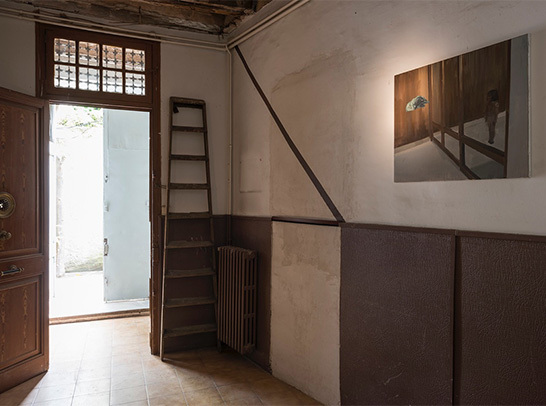 Compositions unfolded through five new temporary site-specific interventions operating at different speeds and rhythms, and one-off events outside of Barcelona’s contemporary art circuit – including a private psychoanalytic library, a former ceramics factory and a botanical collection. Pinpointing some lesser-known aspects of the city's cultural history and municipal life, Compositions offered moments of interruption, intimacy and immersion throughout the weekend. Describing the central pillars of David Bestué’s art as being formed by architecture and historiography is perfectly plausible, yet would sound too grandiose given the generous irreverence of his work. In any case, as the artist would undoubtedly ask, what kind of pillars would we be dealing with exactly? Would they be Romanesque columns or steel beams that were holding up his conceptual edifice? Bestué is primarily a sculptor who is fascinated by architecture – not with its hubristic icons or celebrity heroism, but by the very normality with which architectonic tropes underpin an emotional understanding of form. 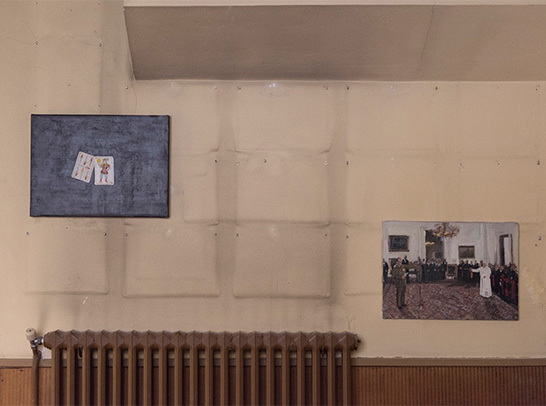 Bestué’s composite sculptures, photographs and publications form a historiography inasmuch as they have often dealt with the evolution of materials and building techniques in a seemingly diagrammatic or didactic way. Yet Bestué’s experiments with mass, equilibrium, gravity, or the physical language of construction (whether referring to Prehistoric rock tombs or public space in post-Olympic Barcelona) always engage us at a human scale and frequently work through heuristics, frivolity, mockery and farce. For ‘Composiciones’ David Bestué produced a new installation in the form of a sculptural timeline defined by ignition and invention, fat and oil, obsolescence, fluorescence, luminescence and incandescence – a history of humanity from antiquity to the present day told through the evolution and refinement of lighting technology. 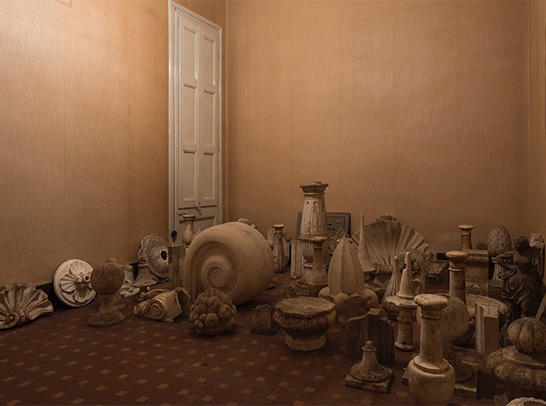 Located in the domestic setting of the former Director’s house within the 1920s Cosme Toda ceramics factory, the installation was companioned by sculptural clusters recuperating Art Nouveau ceramics and plaster pieces found in the factory itself. These linked to Bestué's ongoing interest in the evolution of architectural practice alongside building materials and engineering techniques. 2 october, 19:30h: Guided visit of the intervention by David Bestué and Latitudes. c/ Enric Prat de la Riba, 60. L’Hospitalet de Llobregat. With thanks to Ajuntament de L’Hospitalet, Tomás Langarita, Pau Magrané, Albert Mercadé, Eduard Solanas, Jaume Roig, Federico Vélez. Conversation moderated by Dora García with Montserrat Rodríguez, Estela Paskvan, Nora Catelli, Enric Berenguer, Miquel Bassols and Norberto Ferrer, on the origins of the Biblioteca del Campo Freudiano de Barcelona, its founder Óscar Masotta and the Barcelona of 1977. Introduced by Lidia Ramírez. Conversation between Dora García, Xavier Esqué and Patrick Bohan around James Joyce and Jacques Lacan. Introduced by Rosa Godínez. Dora García’s contribution consisted in pointing out the wealth of information and the activities programmed by the Freudian Field Library, founded in 1977 by the Argentinian art and literary critic, occasional artist, author and psychoanalyst Oscar Masotta (1930-1979) upon his arrival to Barcelona, having fled Argentina's dictatorship and after a brief stint in London. The work of French psychoanalyst and psychiatrist Jacques Lacan (1901-1981), reached Spain not from across the Pyrenees, but from overseas: indeed, it was Masotta who introduced Lacanian thought to the Spanish-speaking world. The relevance of Masotta in "a psychoanalytic branch of Conceptualism" (in the words of art historian Juli Carson) only now seem to be fulfilling its true potential. 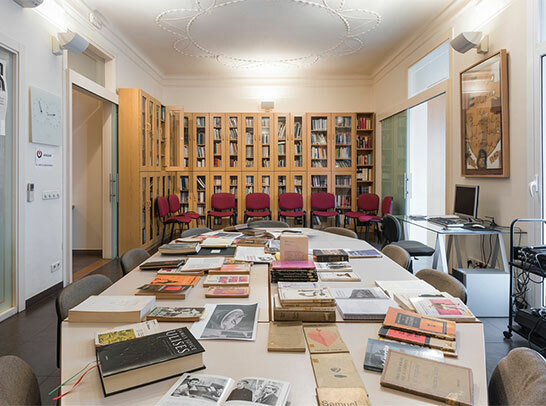 Masotta founded the library together with his fellow citizen Germán García, and their work has been continued since by the Comunidad de Catalunya de la Escuela Lacaniana del Psicoanálisis del Campo Freudiano (ELP), the Catalan Community of the Lacanian School of Psychoanalysis. One of the outstanding aspects of the library is its significant holdings of literary fiction which is not unusual given the interest of psychoanalysis (since its creation by Austrian physician and founder of psychoanalysis Sigmund Freud, 1856-1939) in literature, as well as the relevance of art and literature in Lacanian thought. Lacan's Seminar XXIII 'Le Sinthome' (1975), for example, refers to the Irish novelist James Joyce (1882-1941). 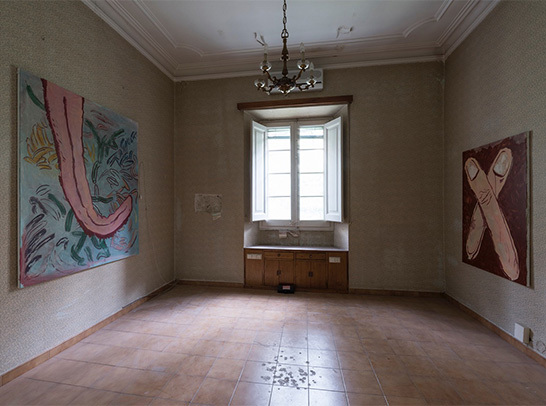 Dora García's intervention considers the site as a knot which ties together art, psychoanalysis and literature. 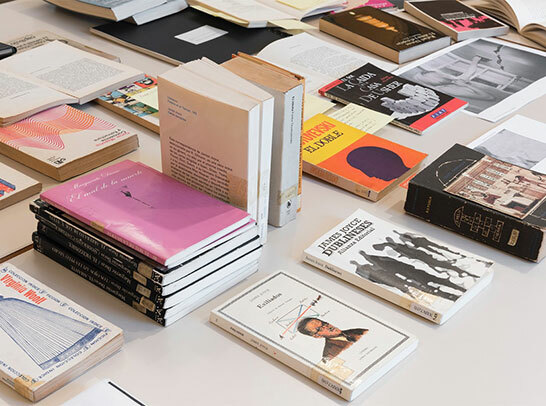 García selected works of fiction from the library shelves and three conversations activated the space over three consecutive days. The first talk, a ‘solo’ by García, focussed on the library’s holdings of literary fiction. The second, involved several psychoanalysts who discussed the founding of the library and its ongoing role in Barcelona, and the final event was a talk around the work of James Joyce and Jacques Lacan. The events were live-streamed on Periscope. With thanks to the Biblioteca del Campo Freudiano de Barcelona, Miquel Bassols, Enric Berenguer, Patrick Bohan, Nora Catelli, Xavier Esqué, Norberto Ferrer, Montserrat Rodríguez, Estela Paskvan. The practice of Jordi Mitjà is inextricably linked with the Empordà, the region in the northeasternmost corner of Catalonia, bordering the Pyrenees and the Mediterranean. Drawing on this territory as a historical resource and as a natural archive, Mitjà’s works emerge from a kind of frontier heritage and local counter-culture. Actual debris and fragments feature in his work as much as those from art history and politics. His art has touched on, for example, the rich legacy of Surrealism and Conceptualism in the region left in the wake of figures such as Salvador Dalí and Marcel Duchamp, and well as the tragic death in 1940 of philosopher Walter Benjamin in the border town of Portbou. (The sculpture Forat d'escala (Stairwell), 2010, incorporates a left-over part of a monument to Benjamin which Mitjà's father manufactured in the 1990s.) Recently Mitjà has eschewed the accumulative editorial strategies and scavenger–archivist approach to images which has characterized much of his previous work. His 2015 exhibition “L’Ordre Feréstec” at Barcelona’s Galeria Maserre for example, marked a turn towards a “povera” approach to sculpture, comprising a series of works utilizing discarded wood, metal, burned paper and clay. 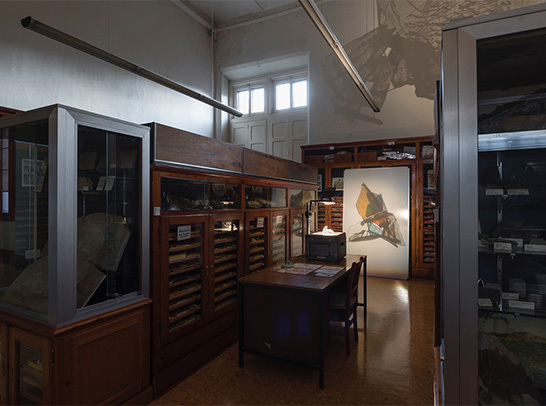 Jordi Mitjà’s contribution to ‘Composiciones’ took place in the Geological Museum of the Seminary of Barcelona – an institution dedicated to paleontology and the study of invertebrate fossils since 1874. Mitjà considered the borders between evolutionary biology and the ancient geology of Catalonia in an installation which focussed on a primitive relationship between materials and morphology. 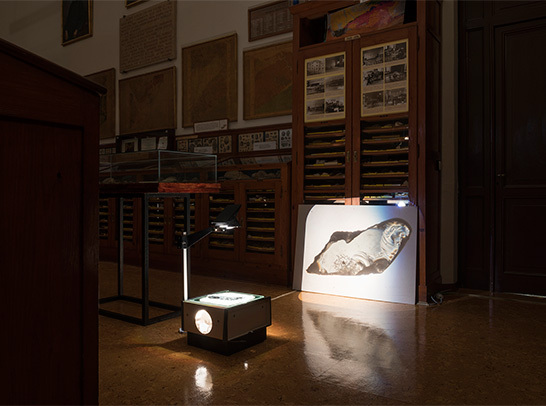 A series of overhead projectors illuminated the central space of the museum with a panoply of images, shadows and geometries – layers that are revealed by Mitjà’s exploration of the geospatial taxonomy of this unique collection of 80,000 specimens. Moreover, Mitjà undertook a personal archeological exercise in unearthing the many drawings he has been making over the years, a selection of which were exhibited here for the first time. 1 Octubre, 17h: Guided visit of the intervention by Jordi Mitjà and Latitudes. c/ Diputació, 231. With thanks to Sebastián Calzada, Santi, Jordi Farré, Sonia Pardina, Mossèn Josep M. Turull. Ramus Nilausen and Pere Llobera are painters. They both approach painting with a respect – at times melancholic, sometimes parodic – for its traditional genres and its ancient integrity as a craft. 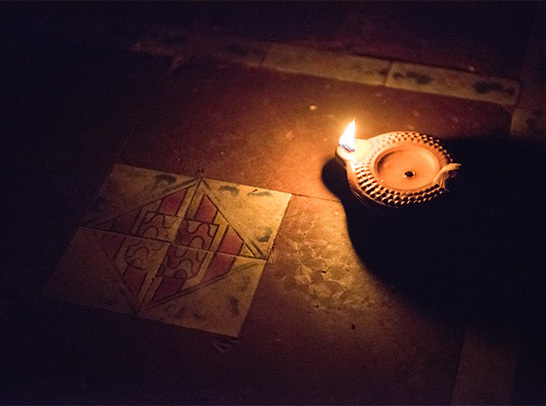 Nilausen’s canvases have often taken on ‘minor’ or anecdotal subjects such as candles or vegetables. Yet in the case of Omnipotence (2013), for example, which depicts a starburst of carrots, jest belies a reflection on some fundamentals of the painter’s faculties – eating carrots supposedly optimizes vision as well as their being a metaphor for effort and reward. Meanwhile The Origin (2014) – ostensibly a canvas representing a bunch of grapes – speaks of a painting by Zeuxis of Heraclea that was so exquisitely life-like that birds flew down to the picture. Llobera frequently addresses the perils of such virtuosity and painterly heroism in his paradoxical, restless works. Paintings from 2012 depict, for example, a painter–figure about to be mauled by a big cat (The puma attacks the plein-air artist) or apparently floating out to sea on an iceberg (The ice boat). Premonition (also from 2012) is a modestly-scaled representation of an apparently sublime landscape – a storm-battered desolate mountain. Yet we soon realize it is in fact a painting of a mound of black refuse sacks and cardboard – a studio diorama technique which Llobera has often returned to. Nilausen and Llobera share a workspace in the Salamina studios in L’Hospitalet de Llobregat – which they cofounded – yet the invitation to collaborate for ‘Composiciones’ was the first time they exhibited together. In the Gardens of La Central del Raval their exhibition ‘Vera Icon’ occupied a former priest's house and explored "acheiropoietic" images – those that have supposedly come into being not by human hand, but miraculously. The Veil of Veronica, for example, refers to various Catholic relics and icons which tell of a piece of cloth said to have been imprinted with the image of the face of Jesus. 4 Octubre, 12h: Guided visit of the intervention by the artists and Latitudes. c/ Elisabets, 8. With thanks to La Central del Raval, Albert Mercadé, Núria Solsona, Antonio Ramírez. The art of Daniel Steegmann Mangrané hinges on the natural and the geometric, often splicing the unfathomable dimension of the forests of his adopted home Brazil with the clear lines of abstraction and man-made order. His work of the last decade has incorporated chromatic watercolour studies, kaleidoscopic collages, photography, as well as sculptures with etched leaves and citrus fruit, yet his recent film and sound projects seem to suggest a fascination with a kind of organic cinema has been ever-present. His 2013 exhibition “Phasmides”, for example, included holograms, sinuous sculptures and a film of a tabletop set comprising branches and white cardboard forms whose protagonists were stick insects, plant-like animals which appear and vanish as estranged spindly shadows. 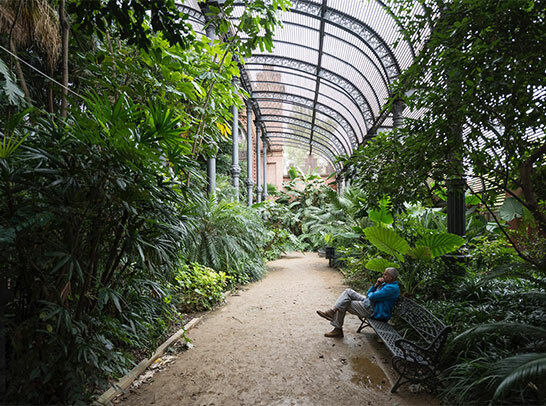 For ‘Composiciones’, Steegmann’s project took place amongst the subtropical plants of the 1887 Umbracle (shade house) in the Parc de la Ciutadella and centred on the acoustic installation “Surucuá, Teque-teque, Arara” (2012). The work is an acoustic installation formed by eight audio tracks that were recorded simultaneously along a 60 meter transect through a remnant section of the Atlantic Rainforest of Brazil (Mata Atlântica). Such dense tropical forest would have been the first habitat Portuguese colonists encountered on their arrival in the year 1500. It is an ecosystem known for its extraordinary biological richness and high degree of endemism, meaning many species exist nowhere else. 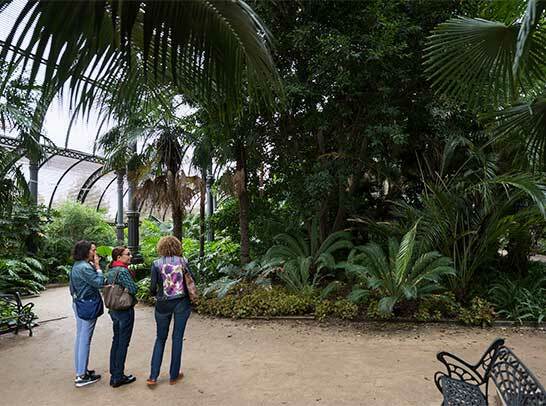 In Barcelona, an eleven-minute loop of the sounds of the forest, including the disembodied calls of colourful birds such as the Surucua trogon, the Yellow-lored tody-flycatcher and macaws (species whose Portuguese names lend Steegmann’s work its title) will merge with the ambient sounds of the city park. As if a 1:1 scale collage, the artifice of an urban botanical collection becomes intertwined with an acoustic slice of a remote yet authentically wild location. 2 Octubre, 12h: Guided visit of the intervention by the artist and Latitudes. Passeig Picasso, 13. With thanks to Direction of Parcs i Jardins, Joan Fericgla/BAF, Emiliano Pistacchi, Dan Zimmerman. Blanca del Río, Jan Monclús, Dídac Bompart, Félix Herrero, Àlex Molina, Enric Calabuig. Roberto Ruiz and Andrea Paesante. Special thanks to Imma Mora, Lídia González Alija and Carolina Macià at the Barcelona Gallery Weekend office and to its Executive Committee. Our heartfelt thanks to David, Dora, Jordi, Rasmus, Pere and Daniel. Art Barcelona – Asociación de Galerías de Arte Contemporáneo Art Barcelona. Ajuntament de Barcelona (ICUB), the Generalitat de Catalunya (ICEC), the Ministerio de Educación, Cultura y Deporte, and the Ajuntament de L’Hospitalet de Llobregat, as well as private sponsors and individual patrons. Intervenciones de Daniel Steegmann Mangrané, Jordi Mitjà, Rasmus Nilausen en colaboración con Pere Llobera, Dora García y David Bestué. Fotos: Latitudes (1) y resto de Roberto Ruiz / Cortesía: Barcelona Gallery Weekend. Con la participación de: David Bestué (en el recinto fabril de Cosme Toda, L'Hospitalet); Dora García (en la Biblioteca del Campo Freudiano de Barcelona); Jordi Mitjà (en el Museu Geològic del Seminari de Barcelona); Rasmus Nilausen en colaboración con Pere Llobera (en la casa del prior de los jardines de La Central, Raval); y Daniel Steegmann Mangrané (en el Umbracle, Parc de la Ciutadella). Latitudes comisarió Composiciones, un programa de cinco intervenciones inéditas producidas especialmente para el primer Barcelona Gallery Weekend. El programa complementó el existente calendario de exposiciones en galerías, museos y fundaciones, con la producción de proyectos encargados a artistas activos de la escena barcelonesa. Los proyectos respondían a su ubicación en espacios singulares – ya fuese por su arquitectura, actividad o por su historia – situados fuera del habitual circuito del arte contemporáneo, como por ejemplo una biblioteca psicoanalítica, una antigua fábrica de cerámica o una colección botánica. Composiciones se desplegó a través de una serie de intervenciones temporales que operaron a diferentes ritmos y velocidades. Destacando algunos aspectos menos conocidos de la historia cultural y municipal de Barcelona, Composiciones proporcionó momentos de intimidad, de interrupción y de inmersión durante el fin de semana. Es perfectamente plausible describir los pilares centrales del trabajo de David Bestué como arquitectónicos e historiográficos. Palabras que, no obstante, pueden parecer grandilocuentes habida cuenta la generosa irreverencia de su obra. Sea como fuere, el artista querría preguntar sin duda, ¿a qué tipo de pilares nos referimos exactamente? ¿Se trataría de columnas románicas o de vigas de acero sustentando su edificio conceptual? Esencialmente, Bestué es un escultor fascinado por la arquitectura pero no así por sus iconos presuntuosos ni por su célebre heroísmo, sino por la propia naturalidad con la que los tropos arquitectónicos sustentan una comprensión emocional de la forma. Las esculturas compuestas de Bestué, sus fotografías y publicaciones conforman una historiografía puesto que a menudo tratan de la evolución tanto de materiales como de técnicas constructivas, en lo que parece ser un modo diagramático o didáctico. Bestué experimenta con la masa, el equilibrio, la gravedad o el lenguaje físico de la construcción (tanto si se refiere a tumbas de piedra prehistóricas como a espacios públicos de la Barcelona post-olímpica) que siempre logra captarnos a escala humana, tratando frecuentemente con la heurística, la frivolidad, la broma y la farsa. Para ‘Composiciones’ David Bestué presentó una nueva instalación en forma de una cronología temporal escultural definida por el encendido y la invención, la grasa y el aceite, la obsolescencia, la fluorescencia, la luminiscencia e incandescencia: una historia de la humanidad desde la antigüedad hasta nuestros días explicada a través de la evolución y el refinamiento de la tecnología de la iluminación. Emplazada en el antiguo domicilio de los años 20 del director de la fábrica de cerámicas Cosme Toda, la instalación se acompañaba de piezas modernistas de cerámica y de yeso halladas en la misma fábrica y que enlazaban con permanente interés de Bestué por la evolución de la práctica arquitectónica, los materiales de construcción y las técnicas de la ingeniería. 2 Octubre, 19:30h: Visita guiada con David Bestué y Latitudes. c/ Enric Prat de la Riba, 60. L’Hospitalet de Llobregat. Agradecimientos: Ajuntament de L’Hospitalet, Tomás Langarita, Pau Magrané, Albert Mercadé, Eduard Solanas, Jaume Roig, Federico Vélez. Conversación moderada por Dora García con Montserrat Rodríguez, Estela Paskvan, Nora Catelli, Enric Berenguer, Miquel Bassols, Norberto Ferrer, sobre los orígenes de la Biblioteca del Campo Freudiano de Barcelona, su fundador Óscar Masotta. Introducción de Lidia Ramírez. Conversación entre Dora García, Xavier Esqué y Patrick Bohan en la Biblioteca del Campo Freudiano entorno a James Joyce y Jacques Lacan. Introducción de Rosa Godínez. La contribución de Dora García consistió en señalar la abundancia de información y de actividades regularmente programadas por la Biblioteca Campo Freudiano de Barcelona – fundada en 1977 por el crítico de arte y literatura, autor, artista ocasional y psicoanalista Oscar Masotta (1930—1979), que fundó nada más llegar a Barcelona, huyendo de la dictadura argentina y tras pasar por Londres. El pensamiento del psicoanalista y psiquiatra francés Jacques Lacan (1901—1981) no entró en España por los Pirineos, sino por ultramar: es Masotta el introductor de su pensamiento en el mundo de habla hispana. La importancia de Masotta en "esa versión psicoanalítica de lo conceptual" (en palabras de la historiadora del arte Juli Carson) parece estar empezando a adquirir ahora sus verdaderas dimensiones. Masotta fundó la biblioteca junto a su compatriota Germán García y desde entonces ha seguido su labor la Comunidad de Cataluña de la Escuela Lacaniana de Psicoanálisis (ELP). En esta biblioteca, llama la atención la gran cantidad de libros de ficción que alberga. Esto no es de extrañar, dado el interés del psicoanálisis por la literatura, desde su creación por el neurólogo austriaco y fundador del psicoanálisis Sigmund Freud (1856-1939), así como la importancia del arte y la literatura en el pensamiento lacaniano –como ejemplifica su Seminario 23 'Le Sinthome' (1975), que toma como referencia la obra del novelista irlandés James Joyce (1882—1941). La intervención de Dora García señala esta biblioteca como un posible nudo de confluencia entre arte, psicoanálisis y literatura. Durante tres días consecutivos el espacio se activó mediante tres conversaciones–seminarios así como un elenco de publicaciones de literatura de ficción seleccionadas del fondo de la biblioteca. La primera conversación –un soliloquio de García— se centró en la literatura de ficción que contenía la biblioteca. En la segunda, un grupo de invitados hablaron de la fundación de la biblioteca y sobre su historia en el contexto barcelonés. El último evento se centró las figuras del novelista irlandés James Joyce y el psicoanalista francés Jacques Lacan. Los tres eventos fueron retransmitidos en directo via Periscope. Agradecimientos: Biblioteca del Campo Freudiano de Barcelona, Miquel Bassols, Enric Berenguer, Patrick Bohan, Nora Catelli, Xavier Esqué, Norberto Ferrer, Montserrat Rodríguez, Estela Paskvan. La obra de Jordi Mitjà está íntimamente asociada con la región del Empordà, en el nordeste de Cataluña, bordeando los Pirineos y el Mediterráneo. Inspirándose en este territorio como recurso histórico y archivo natural, la obra de Mitjà emerge de una especie de herencia fronteriza y de la contracultura local. Residuos auténticos desechos figuran en su trabajo tanto como lo hacen los fragmentos de la historia del arte o de la política. Su arte hace referencia, por ejemplo, al rico legado del surrealismo y del conceptualismo de una región donde Salvador Dalí y Marcel Duchamp hicieron mella y en la que en 1940 tuvo lugar la trágica muerte del filósofo Walter Benjamin en la ciudad fronteriza de Portbou. (Su escultura Forat d'escala (2010) incorpora un fragmento de una parte del monumento dedicado a Benjamin que el padre de Mitjà construyó en la década de los 90.) En tiempos recientes, Mitjà ha dejado a un lado su estrategia editorial acumuladora y su actitud de basurero-archivista hacia las imágenes que había caracterizado su obra anterior. En 2015, por ejemplo, su exposición “L’Ordre Feréstec” en la Galería Maserre de Barcelona marcó un cambio hacia una actitud "povera" hacia las esculturas mostradas y entre las que se incluía una serie de trabajos hechos con restos de madera, metal, papel quemado y arcilla. Jordi Mitjà situó su proyecto en el Museo Geológico del Seminario de Barcelona, una institución dedicada al estudio de los fósiles desde 1874. Aquí Mitjà recapacitó sobre la frontera existente entre la biología evolutiva y la geología antigua en Cataluña, en una instalación centrada en la relación primitiva entre materiales y morfología. 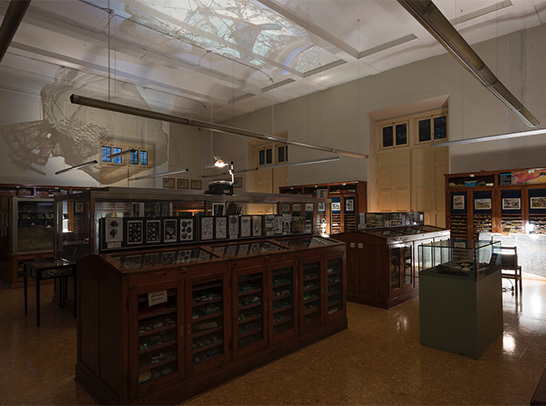 Siete retroproyectores iluminaron el espacio central del museo, presentando una serie de panoplias de imágenes, sombras y geometrías dibujadas sobre vidrios encontrados, una segunda capa que el artista añadió con el fin de explorar la taxonomía geo-espacial de esta única colección de 80.000 especímenes. Finalmente, Mitjà llevó a cabo un ejercicio arqueológico personal desenterrando dibujos que ha ido realizando en los últimos años, una selección de los cuales se exhibió aquí por primera vez. 1 Octubre, 17h: Visita guiada con Jordi Mitjà y Latitudes. c/ Diputació, 231. Agradecimientos: Sebastián Calzada, Santi y Jordi Farré, Sonia Pardina, Mossèn Josep M. Turull. La pintura de estos dos artistas coincide por su actitud respetuosa, a veces melancólica o paródica, hacia el género tradicional y su primitiva integración artesanal. A menudo, las telas de Rasmus Nilausen se conciernen con una temática "menor" o anecdótica, como por ejemplo las velas de cera o las verduras. No obstante, en el caso de Omnipotence (2013), por citar un ejemplo, donde el artista representa una explosión de zanahorias, su gestualidad delata una reflexión sobre la fundamentalidad de las facultades del pintor. Comer zanahoria, se supone, mejora la vista y es, además, una metáfora de recompensa por el esfuerzo realizado. En The Origin (2014), el lienzo muestra principalmente un racimo de uvas, en referencia a un cuadro de Zeuxis de Heraclea, tan exquisitamente realista que los pájaros se posaron sobre él. A menudo Pere Llobera se refiere a los peligros del virtuosismo y la heroicidad pictórica que adornan su obra inquieta y paradójica. Sus cuadros de 2012, por ejemplo, muestran a un pintor a punto de ser devorado por un felino (The puma attacks the plein-air artist) o aparentemente flotando en alta mar sobre un iceberg (The ice boat). Premonition, también de 2012, es una representación de modesto tamaño de un paisaje aparentemente sublime, de una desolada montaña devastada por la tormenta. Sin embargo, nos damos cuenta enseguida de que en realidad se trata de un montículo de sacos negros de desecho y de unos cartones: una técnica de diorama de estudio a la que Llobera ha recurrido con frecuencia. Nilausen y Llobera comparten su espacio de trabajo en los estudios Salamina en L'Hospitalet de Llobregat que ambos co-fundaron, aunque la invitación a que colaboren en ‘Composiciones’ ha sido la primera vez que han expuesto juntos. Su exposición ‘Vera Icon’, se ubica en la antigua casa de un sacerdote en los jardines de La Central del Raval, con obras que exploran la imaginería “aqueiropoietica" —aquellas imágenes que, supuestamente, no han sido creadas por la mano humana sino a través de un milagro. El Velo de la Verónica, por ejemplo, es el reflejo de varias reliquias e iconos católicos estampados en un trozo de tela en el que, según se dice, quedó marcada la imagen del rostro de Jesús. 4 Octubre, 12h: Visita guiada por los artistas y Latitudes. c/ Elisabets, 8. Agradecimientos: La Central del Raval, Albert Mercadé, Núria Solsona, Antonio Ramírez. El arte de Daniel Steegmann Mangrané conjuga lo natural con lo geométrico y a menudo combina las imposibles dimensiones de los bosques de Brasil, su país de adopción, con las líneas claras de la abstracción y el orden tangible. En la última década el artista ha incorporado a su obra estudios cromáticos en acuarela, collages caleidoscópicos, fotografía y esculturas con grabados de hojas y de cítricos. No obstante, su filme más reciente y sus proyectos sonoros parecen indicar que la fascinación hacia una especie de cinematografía orgánica siempre ha estado presente. “Phasmides”, por ejemplo, exposición de 2013, incluía hologramas, esculturas sinuosas y una filmación desde un pequeño escenario montado sobre una mesa con ramas y formas en cartón blanco donde los protagonistas eran unos insectos palo y animales semejantes a plantas que aparecían y desaparecían como si se tratara de sombras a la deriva. 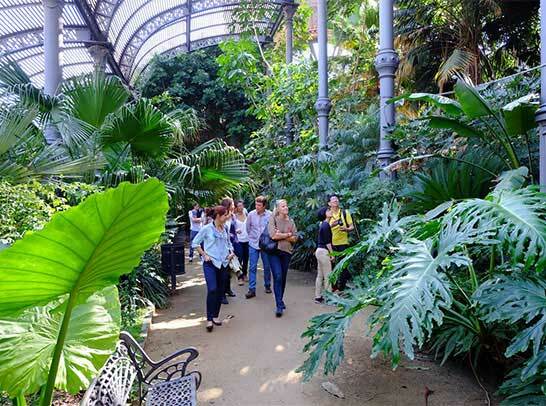 El proyecto de Steegmann discurrió entre las plantas subtropicales del Umbráculo del Parc de la Ciutadella, finalizado en 1887, y se centró en una instalación sonora “Surucuá, Teque-teque, Arara” (2012). Se trata de una instalación acústica compuesta por ocho pistas de audio, grabadas simultáneamente en un trayecto de 60 metros, a través de los restos de un terreno de la selva atlántica de Brasil (Mata Atlântica). La frondosidad de esta selva tropical habría cobijado a los primeros colonizadores portugueses a su llegada en 1500. Se trata de un ecosistema conocido por su riqueza biológica y un alto grado de endemismo, lo cual significa que muchas de sus especies no existen en ninguna otra parte. En Barcelona se presenta un loop de 11 minutos con sonidos de dicha selva, incluyendo las llamadas espectrales de pájaros multicolor como por ejemplo las del Trogon surrucura, el titirijí cabecigrís, y guacamayos, mezcladas con el ruido ambiental del propio parque urbano. Steegmann dio nombre a su obra a partir de la terminología portuguesa para designar estas especies aviarias. Como si se tratara de un collage a escala 1:1, el artificio de una colección botánica urbana se entreteje con un fragmento acústico de algo genuinamente selvático. 2 Octubre, 12h: Visita guiada por el artista y Latitudes. Passeig Picasso, 13. Agradecimientos: Dirección de Parcs i Jardins, Joan Fericgla/BAF, Emiliano Pistacchi, Dan Zimmerman. Roberto Ruiz y Andrea Paesante. Oficina organizadora del Barcelona Gallery Weekend (Imma Mora, Lídia González Alija y Carolina Macià) y a su Comité Ejecutivo. Nuestro sincero agradecimiento a David, Dora, Jordi, Rasmus, Pere y Daniel. Art Barcelona– Asociación de Galerías de Arte Contemporáneo Art Barcelona. Ajuntament de Barcelona (ICUB), la Generalitat de Catalunya (ICEC), el Ministerio de Educación, Cultura y Deporte y del Ajuntament de L’Hospitalet de Llobregat, así como de patrocinadores privados y mecenas particulares.